Preheat barbecue to medium heat. GRILL chicken 7 min. on each side or until cooked through, brushing occasionally with the barbecue sauce. Meanwhile, place rolls, cut sides down, on grate of barbecue; grill until lightly toasted. 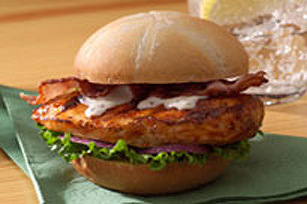 Place chicken breast on bottom half of each roll; top with 1 lettuce piece, 2 bacon slices and 1 Tbsp. of the dressing. Cover with tops of rolls. Substitute 2 rustic bread slices for each roll. Then, add red onion rings, arugula leaves and sundried tomatoes to the sandwiches. Or, try adding your favourite Kraft Singles Procesed Cheese Product Slices.